Paintless Dent Repair, in most circumstances, will cost you less than going the traditional route of auto body repair. 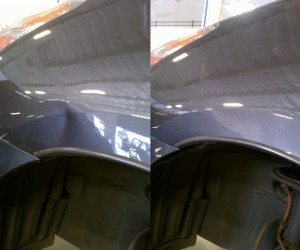 To ensure that you get the best repair for your next dent removal, make sure that the dent technician has a good reputation, years of experience, and is truly qualified to perform the job. Buyer Beware: There are several dent techs who have very little experience, and are willing to tell you what you want to hear in order to get your business. Do your due diligence before you hire him or her to repair your vehicle! Dent Erasers LLC doesn't provide a list of prices online due to the simple fact that every dent, crease, and ding requires a unique strategy of removal. Depending upon the location of the dent, the overall size, and other variants, pricing a car can vary. Only a qualified dent tech can give you an accurate estimate of cost after he sees the damaged area. For example: Top panels (hoods, roofs, trunks) cost is usually higher than side panels. Roof dents may require the headliner to be partially detached in order to reach the roof dent, that could add to the price of servicing the vehicle. Or another instance would be having to remove tail lights in order to take out the dents in quarter panels. Creases are generally more of a cost due to the difficulty in removing them with no visible flaws. We provide very competitive pricing. The terms of service will be disclosed to you before the work is started, ensuring no surprises when it comes to the bill. Dent Erasers constantly strives to be the best paintless dent repair company for the East Bay and other immediate areas. 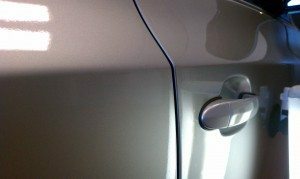 Dent Erasers also guarantees your complete satisfaction, so why not call or email us today and get your Free Estimate? Don't live with that dent any longer – remove it for good now! 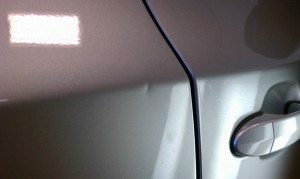 Paintless Dent Repair is a process of using specially fabricated tools to meticulously remove minor dents without the use of traditional bodywork. This process entails massaging the damaged area from the inside out and returning the vehicle to its original condition. No sanding, body fillers, or paint is necessary. Dings and dents are removed without a trace, as if the damage had never occurred. Paintless Dent Repair can save you time and money and eliminate the hassle of having to deal with insurance companies and body shops. Most providers offer mobile services at your home or place of work. No need to rent a car or rearrange your schedule. The repairs can take just a few minutes to a few hours and save you up to 70% of traditional body shop costs. Prices vary by geographical location as well as the size of the repair. An average repair job will cost a customer around $250. For car enthusiasts, quality paintless dent repair is often a great substitute for a full paint job. Whenever possible, it’s best to keep the original paint. Quality paintless dent repair, combined with a professional detail, can restore vehicles to showroom condition for less than $500. And having your car reconditioned once a year with paint-less dent removal will keep your vehicle looking pristine and increase its value. Dent Erasers LLC is amongst a small group of qualified companies in the East Bay, and general Bay Area available to perform this service. Results depend on the skill of the individual Paintless Dent Repair technician.